Do you have lawn grubs in your yard? Lawn grubs, also called white grubs, feed on grass roots in your lawn and can cause sections of your grass to die. Grubs come out in the spring to start feeding, then change into pupae that will turn into beetles in the summer. 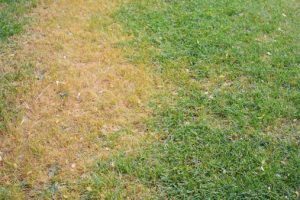 Before your grassroots get eaten this season, take a look at our tips on how to deal with lawn grubs. Grubs are C-shaped creatures with soft bodies and are the immature form of scarab beetles, including Japanese and June beetles. They eventually turn into adult beetles that feed on garden foliage and flowers, then mate and lay eggs in the soil. These eggs hatch in the fall and new grubs start the lawn-destroying process all over again. There are a few signs to look out for to know if grubs are feeding on your lawn. First, as your grass turns green in the spring, look for brown patches that never fully turn green. Lift up a small piece of turf and check for grassroots. If there are no roots or the dead patch rolls up like a carpet, it is a sign that grubs ate the roots last fall. Also, look out for irregularly shaped dead patches that appear in late summer or early fall. Check for grubs by using the same method of checking for grassroots. If you see an unusual amount of animals such as birds, skunks, raccoons, or moles digging in your lawn, it’s possible that they are trying to uncover the grubs. However, they may also be eating earthworms, so it’s important to use the method listed above to ensure that you do have lawn grubs. Lastly, if your lawn is well-watered and has a spongy feeling, this could be an indication of lawn grubs eating the grassroots. Before deciding on any treatment methods, inspect your lawn for the extent of the lawn grub infestation. If you only find five grubs or less, there is no reason for treatment. If you find anywhere from six to 10 grubs and have a healthy lawn, you only need to treat if animals are digging up your lawn. And if you find over ten lawn grubs, you should start treatment. There are many products available to control grubs, some with active ingredients. Before applying the insecticide, be sure to read the ingredient list and the directions of the legal rate at which the product can be used. After applying the insecticide, it’s crucial to water the area thoroughly. This entry was posted on Thursday, March 22nd, 2018 at 4:51 pm. Both comments and pings are currently closed.